A war between North Korea and the US is now a “real possibility”, and would likely result in thousands of people being killed or injured, a respected defence think tank has warned. War between the two countries would likely involve a full scale invasion of North Korea, and combat would be neither “surgical nor short”, the Royal United Services Institute (Rusi) said in a report. The disturbing analysis, written by Rusi director general Malcolm Chalmers, says a war could be triggered by either Washington or Pyongyang, but it warns there is a growing risk action could be taken by Donald Trump to “resolve” the issue “sooner rather than later”. The warning comes after North Korean Foreign Minister Ri Yong-ho claimed the US President's threat that Kim Jong-un’s regime “won't be around much longer” amounted to a declaration of war and said Pyongyang had the right to take countermeasures. North Korea has moved military aircraft to its east coast and begun boosting defences in the wake of the statement. Pyongyang also threatened to shoot down American bombers flying near the Korean peninsula “even when they are not inside the airspace border of our country”. The hostile rhetoric between the two countries has reached new heights as the two leaders have increasingly traded threats and personal insults. 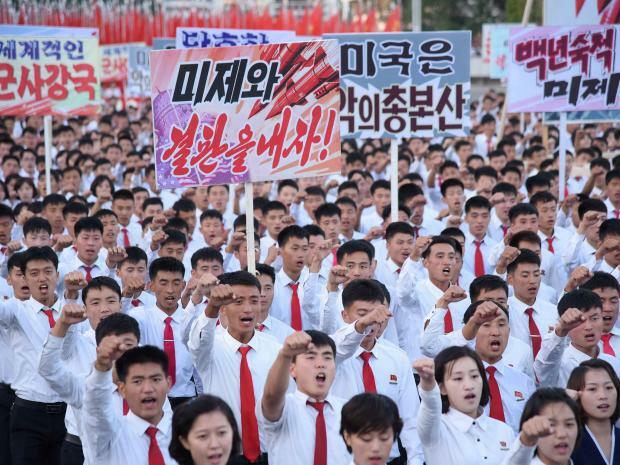 Mr Trump last week dismissed the claim of a declaration of war, but warned if the US was forced to defend itself it would have “no choice but to totally destroy” North Korea, a country of 26 million people. Mr Trump has repeatedly described Mr Kim as “rocket man”. In response, Mr Kim issued an unprecedented personal statement in which he pledged to “tame the mentally deranged US dotard with fire”. The Rusi report sets out a number of ways a war could be started. It says these could include a pre-emptive strike by Pyongyang if it believed the US was planning a surprise attack. An outbreak of war would be likely to involve an early large-scale US-led air and cyber offensive, the report said. This scenario would likely provoke retaliation by Pyongyang against South Korea - where around 8,000 Britons live. American bases in the region would also be a target, and Mr Kim’s regime would probably use conventional, chemical or possibly nuclear weapons. That would mean a full-scale invasion of North Korea would be highly likely, the report said. Though Pyongyang is known to have developed its nuclear technology faster than previously thought, even without the use of nuclear weapons, the casualties would likely reach into the hundreds of thousands, the report says. A war would also have “far-reaching consequences” for the global economy. Should the US launch a “preventive strike” on North Korea without South Korea's agreement, it would send a signal that Washington was willing to “sacrifice Seoul to protect New York”. The report calls on the UK government to continue work to intensify international sanctions on North Korea and to support efforts to find a diplomatic solution. The UK government must also urge the US to rule out preventative strikes and begin preparations for a range of military scenarios, the report says. 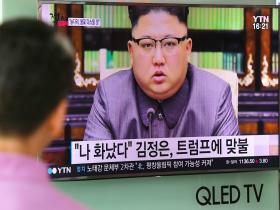 However, it adds the UK should not give the US unconditional support should Washington launch a surprise attack on North Korea, and said London must listen to South Korea and Japan. The report states: “The UK government would have, at most, only a few hours to make clear how it stood on what would be one of the most momentous strategic shocks of the post-Cold War era.